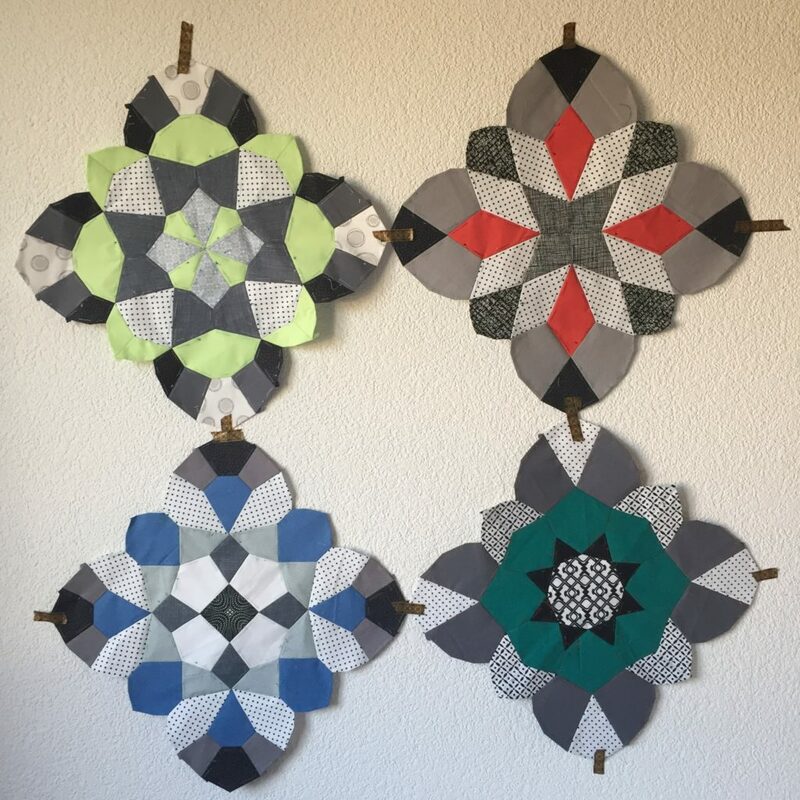 Wow, it’s already the fourth month of my BOM and I’m really hoping that everyone who’s still sewing with me is having fun. I’ve found last month rather difficult as I couldn’t sew or type as I was suffering from tendonitis. Everything’s more or less alright now, although I still have to be a little careful and take enough breaks. I just about managed to finish my March tile in March, finishing it on the 31st. 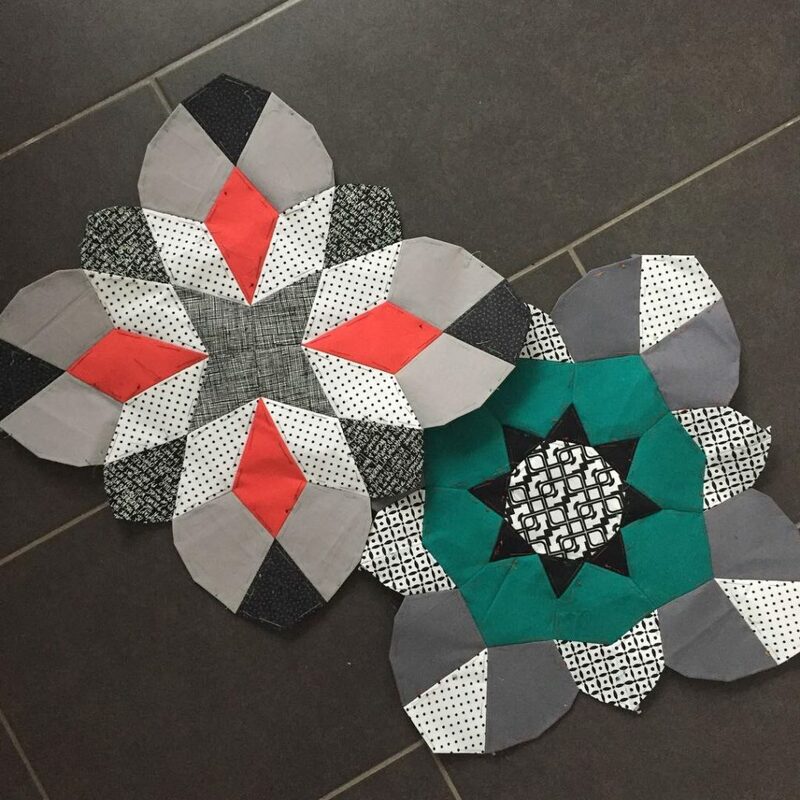 I love my last block which I did with Kona Honeysuckle, one of my favourite Kona colours. I’m already looking forward to this month’s colour which is Kona Banana, another firm favourite. I think the four blocks look quite good together, although I’m not sure if I’m going to keep the emerald block the way it is. I feel that the colour is too solid. However, I won’t do anything about it until I have a few more blocks and can judge it properly. So without much ado, here are the templates for April’s block. And here is the PDF for the entire tile, so you can do some planning. By the way, I’m preparing a blog post about layouts. I’m using a very simple 3 x 4 layout as I’ve always said that I want to use the quilt-as-you-go method. I haven’t started quilting yet as I wasn’t sure about the background fabric. There are so many different possible layouts, though, that I thought it might be fun to show them here on the blog. As for the background fabric I have now narrowed it down to two, one white with grey polka dots and one grey and white striped one. The second I’m sure which one to choose I’ll start working on appliquéing the tiles and quilting the first few blocks. 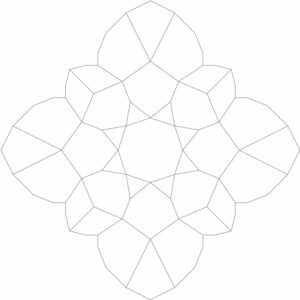 Here you can download a pdf of the entire tile so you can colour it in and play with your fabric placement. I hope you’re enjoying this Block of the Month as much as I am. Keep sewing! Hello! I finished my January blocks way too quickly and have been longing to continue with February’s tile. I did go for the black, grey and white with a pop of colour and I’m loving it so far. This is totally not what I would normally go for and it’s so nice to challenge myself in this way. You only need one of the center squares from template 3a so you can discard the other three. I hope you’re enjoying this Block of the Month as much as I am. Happy stitching! Hello! I’m really excited to start the Block of the Month 2019 with templates for not one but two tiles. My thinking behind this is that first of all people are usually most enthusiastic about a project at the beginning of it and secondly you then have the whole of December to finish off the quilt. To download the templates for the first two blocks click on the links below. You need to print out each template four times. However, for tile 2 you can then discard three of the centre pieces as you only need one. When you’re printing, make sure your printer is set to 100% rather than ‘fit to page’ or any other setting as the tiles otherwise may end up different sizes. 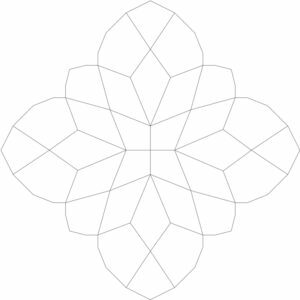 If you’d like to print out the whole tile so you can colour it in and try different options you can click on the links below. I’ve printed out my templates and can’t wait to start. I’m still dithering about fabrics and colours, though, which makes it rather difficult. 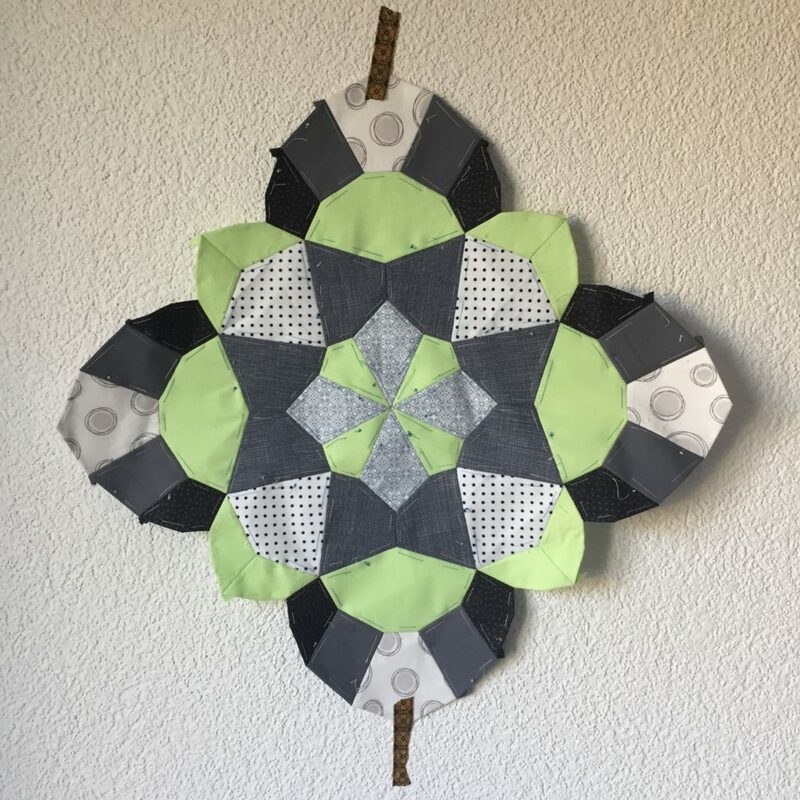 I love scrappy, colourful quilts and I’ve already done a few so I’m wondering if this time I should go for a more uniform look. One of my ideas is to go for a black, white and grey theme, maybe with some colour thrown in for the background. If you’re joining in and are on social media, could you please add the hashtag #sharksdinnerbom2019 to your pictures? It’ll make it easier for me to find your pictures and enjoy your progress. Thank you! If you need any tips and tricks for EPP, check out my next blog post. The templates for the next tile will be uploaded on February 1st 2019. Get sewing! This is the (new) home of Shark’s Dinner. We are under (re)construction so please bear with the mess.